The good news is that The Family Shame is now out in paperback <grin>. The bad news is that my health has been going up and down like a yo-yo. I started The Long-Range War two weeks ago, with the intention of getting as much done as possible before my wife and family took me to Amsterdam for a week. As it happened, I got four chapters into the story before my health collapsed, making it impossible to write for a few days and then limited what I could do for the remainder of the time before my holiday. I’ve only just resumed the story, which stands (as of today) at twenty chapters. My best guess, barring another health collapse, is that it will be released midway through July. That said, I’m hoping to press on. The Broken Throne will be coming after The Long-Range War, which will – hopefully – conclude events started in The Princess in the Tower. I’ve also started plotting out the next arc of The Empire’s Corps, starting with a stand-alone and then following with the adventures of (former) Prince Roland as he joins the Marines, although I’m not quite sure when they will be coming. I also need to write the sequel to Invincible at some point too <grin>. It’s neither your business, nor the business of this blasted paternalistic government, to tell a man not to risk his life doing what he really wants to do. The trouble with any detailed examination of Heinlein’s shorter works, which are often compiled in larger volumes, is that there is a great deal of duplication. Life-line, Heinlein’s first story, is reprinted in at least three separate volumes – and it is far from the only one to have been duplicated. Indeed, as the compilation volumes are put together by theme, it would be surprising indeed if there weren’t more duplications. I have therefore put my comments on some of the stories within The Man Who Sold The Moon/Orphans of the Sky under other titles. Heinlein, an engineer, was fascinated by the impact of new technology and ideas on society. Both The Man Who Sold The Moon and Orphans of the Sky have social impact as a common theme, although – on the surface – they don’t seem to go together. Baen Books put them together when republishing the two books as one and I think they work together fairly well. They are not the best of Heinlein’s works, but they are among his most significant. The Roads Must Roll is an odd little story. Near-future America is dominated by the ‘roads,’ effectively giant railroads moving everything from cargo to passengers from place to place. The roads are so important that shutting them down will prove disastrous. Unfortunately, a handful of road engineers – convinced that their importance to society gives them the right to dictate to others – go on strike, shutting down a couple of roads. They have to be defeated before the whole system collapses. It’s an interesting point – and one with much relevance to modern-day life. The people who join revolutionary groups are almost always convinced that they will come out on top – and they’re almost always wrong. The Man Who Sold The Moon is the story of the man who laid the groundwork for the first missions to the moon, doing everything in his power to realise the lunar dream. DD Harriman, a man obsessed with reaching the moon, raises money and organises the first flights to the moon, intending to eventually go there himself. Unfortunately, the house of cards he’s built is dependent on his presence … and he can’t go, not if he wants the moon to be colonised. The man who settles the moon is forever denied the chance to visit himself. It is, in many ways, a bittersweet tale. It touches on many interesting points. Harriman flatly refuses to pay off a woman who sues his company on spurious grounds, pointing out that buying her off will simply lead to more lawsuits and a constant outflow of money. He talks about the importance of investing in the future, although his detractors are not entirely wrong to point out that, if they fail to recoup their investment, they’re screwed; he talks about the importance of going well by one’s employees, insisting that the company has to take care of them. Harriman wins a great deal of personal loyalty and it serves him well. Sneakily, Heinlein also points out that corporate small-print often provides an excuse for not doing something. Requiem, the sequel (although it was actually written first) is the story of Harriman actually making the flight to the moon, right at the end of his life. It is one of Heinlein’s few truly emotional stories, all the more so as Heinlein doesn’t try to force emotion. Harriman is both a giant of a man and an aging man, threatened with losing control of his life to his heirs (who try to declare him senile) and desperate to make one final bid to reach the moon. His death, just after they land, is genuinely tragic, but it is also a triumph. Harriman got to leave the world on his own terms. Orphans of the Sky features what may well be the first generation starship in science-fiction, on a voyage to a nearby star. Unfortunately, something went badly wrong and there was a mutiny, resulting in the near-complete destruction of the ship’s records. By the time the story takes place, the ship is divided into two sections: a tribe of pureblood humans, ruled by the ‘Captain’ and gangs of mutants, one of which is lead by a two-headed man. Neither side realises that there is a world outside the ship’s walls. To them, the ship is all there is – and ever will be. The hero of the book, Hugh Hoyland, is born into the human tribe. Being more intelligent than most of his peers, he is recruited into the scientists – an inner group who keep things running – and then, after a raid into mutant territory goes badly wrong, he finds himself a prisoner (and a slave) instead. This actually works out in his favour, as he befriends the two-headed mutant and, more importantly, discovers the truth behind the ship. They’re approaching their new homeworld. Orphans of the Sky showcases just how a restrictive society can restrict a person’s mind, from being unable to comprehend that there might be a world outside their walls to being practically conditioned to slavery. (Hugh accepts his servitude without demur, an unusual trait in a Heinlein hero.) The social tensions that eventually rip the ship and crew apart cannot be suppressed indefinitely, particularly when they are faced with something that is – by their lights – blasphemy. (An Outside Context Problem, as Iain Banks put it.) Matters are not helped by ambitious people on both sides using the crisis as an excuse to gain power, then turning on the others. They are more interested in their own power than saving their people. The book also shows the flaws in tribal societies. There is literally no room for freethinkers, let alone open debate … to the point that several factions are plotting revolution just to get control of the levers of power. But the tribe has no choice. The dictates of survival are paramount. And yet, when the ‘good guys’ gain power, they hold purges themselves. Hugh and his allies are not always good people. Indeed, Hugh is pretty much a domestic abuser in his later days. Overall, the collection of The Man Who Sold The Moon and Orphans of the Sky is well worth a read. Heinlein might not have reached towering heights – yet – but the stories open one’s mind, make you think … and lead directly to other, younger works. “I’m a citizen of the System,” [Don] said harshly. The key to writing a juvenile book that appeals to all ages, as I will discuss later in greater detail, is balancing relative simplicity with a plotline and characters that don’t insult adult intelligence. A juvenile does not want to try to figure out the complex metaphysics of Stranger in a Strange Land, for example, while an adult does not want to bore himself with the lacklustre simplicity of Rocket Ship Galileo. Juvenile books can and do have big ideas, as Heinlein proved time and time again, but they have to express those ideas in a way that, first and foremost, appeals to the target audience. Appealing to adults is a bonus. Between Planets is quite successful in appealing to juveniles, and I enjoyed it a great deal when I was a child, but it isn’t quite so good in retrospect. Rereading the book reminded me of just how much Heinlein managed to cram into a relatively short story, yet it also pointed out plot-holes and other weaknesses that let the side down. Truthfully, I would say that Between Planets is one of the lesser juveniles. Don Harvey, a teenage schoolboy at a boarding school on Earth, wants nothing to do with politics. He comes from a mixed family – his scientist father was an Earth citizen, his scientist mother a Venus citizen and he was born in interplanetary space – and he doesn’t have a side. Both worlds are quite strange to him. However, politics is about to take an interest in him. Earth, growing increasingly repressive under the Federation’s law, has been threatening Venus … and the colonials are on the verge of open revolt. Don is barely aware of how bad things have become until he gets a message from his parents, ordering him to travel to Mars at once. Oh, and he has to look up an old friend of his family along the way. Dismissed from his school, Don meets the friend and is given a gift for his parents – a child’s plastic ring, wrapped in paper. He is still puzzling over this when he gets arrested and interrogated by the security services, who appear to believe that he was given a message for his parents. After much trouble, Don is released – with the ring. The security services keep the paper, apparently under the belief that there might be an invisible message on it, and tell Don to leave the planet. His family friend apparently died of heart failure (which is, as Don realises, true of every form of death). Taking ship to an orbital station, where he was meant to board his ship to Mars, Don discovers that it was captured by a raiding party from Venus. Having nowhere else to go – and being vouched for by a Venus Dragon (one of the planet’s natives) – Matt is allowed to go with them to Venus, where he finds himself in a political limbo. He gets a job washing dishes to save money to send a message to Mars; eventually, he gets close enough to a girl – Isabel – to ask her to take the ring for safekeeping. This is only just in time. Venus is invaded, Don is captured … and, unsurprisingly, the invaders want the ring. … And the story just ends. I think that Between Planets is a fun read – and I enjoyed it a lot when I was a kid – but there are too many plot holes for me to take it seriously these days. The greatest of them, perhaps, is the simple fact that too many things could have gone spectacularly wrong. Don didn’t know – didn’t even guess – the true importance of the ring. He could have lost it, or sold it, or simply given it away at any moment along his trip to Venus, never knowing what he’d managed to lose. On one hand, what Don didn’t know Don couldn’t tell; on the other, Don could easily have thrown the ring away at any moment. The whole plot, which was thrown together at the last minute, could have gone badly wrong. Someone might easily have taken the ring off Don too. The security services could have confiscated it just to be dicks. Indeed, the oddly businessman-like attitude of the security goons is at variance with real secret policemen. The kind of people who drift into those jobs love wielding power over their fellow men. They cannot tolerate any challenge, any more than a religious man can tolerate a challenge to his faith. It’s odd to see such nasty bastards be so understanding of Don’s hatred, let alone let him go (with the ring) afterwards. But then, there are limits to how far Heinlein could go in a juvenile book. Sixth Column was far more detailed in showing how secret policemen keep a society under control. The second major problem is that the story reaches a certain point – the final engagement in space – and then stops. Don is not reunited with his parents, nor does he ever get to Mars; there’s no hint of what the post-war system will look like, now the war is over. And it would have been nice to see what his parents made of their son, now a man. Indeed, Don himself is the core of the story. The politically-neutral young man who didn’t care about politics is forced to realise, to borrow a line from Heinlein himself, that politics is sometimes interested in him. He’s oddly passive, compared to some of Heinlein’s other heroes, but he does a lot of growing along the way. By the time Venus is invaded, Don is prepared to fight for it. There are some odd moments – he doesn’t seem to grasp the symbolism of giving Isabel a ring – but he is a genuine hero. And yet, from another perspective, it’s possible to see him as a little brat. Given what was at stake, it’s hard to blame some of the rebels for being irritated with him. But then, he also got pushed around a lot while he was on Earth. Indeed, people who see themselves as global citizens – ‘citizens of the system,’ as Don puts it – are cutting themselves off from their homes. Why should someone who shows no loyalty to their country be defended by their country? It’s quite hard, now, to have any emotional attachment to an ideal – the European Union or the United Nations – and people who claim to be global citizens are only ducking the question of nationality. In the meantime, those who are nationalists regard them as potential traitors. Nationalism has led to many evils, throughout history, but so too has an absence of nationalism. It’s a question of perspective. “The [invasion of Venus] should not have happened, of course. The rice farmer sergeant had been perfectly right; the Federation could not afford to risk its own great cities to punish the villagers of Venus. He was right – from his viewpoint. Heinlein, as always, paints a fine universe. It’s clear, right from the start, that Earth is a repressive state on the brink of a war scare. His interplanetary travel descriptions are as excellent as always, although nowhere near as detailed as Farmer in the Sky or Starman Jones. And Venus, while bearing no resemblance to the real Venus, is a convincing colonial society, mingled with alien life forms that seem mildly amused with humanity. It’s the sort of place I might like to live, if there wasn’t the threat of an invasion. There are also some moments where Heinlein predicts the future, including Don carrying and using something akin to a mobile phone. But, in other places, the book is tissue-thin. Don develops a relationship with Isabel, and at the end of the book seems to think he will be marrying her, but the relationship is so thin as to be unconvincing. (Heinlein himself pointed out that there were difficulties in including romance in juvenile books, running the risk of annoying either male readers or their parents.) The logic of using Don as an unwitting courier makes no sense, and putting him on the spacecraft is a dubious decision, while the end of the war isn’t explored at all. It’s nice to see Don finding a place, of sorts, but the story just ends. Truthfully, Between Planets is a fun little read, but I think it is perhaps the least of Heinlein’s juveniles. She ignored her flunkies as they scurried to do her bidding, instead lifting her eyes to the massive display. 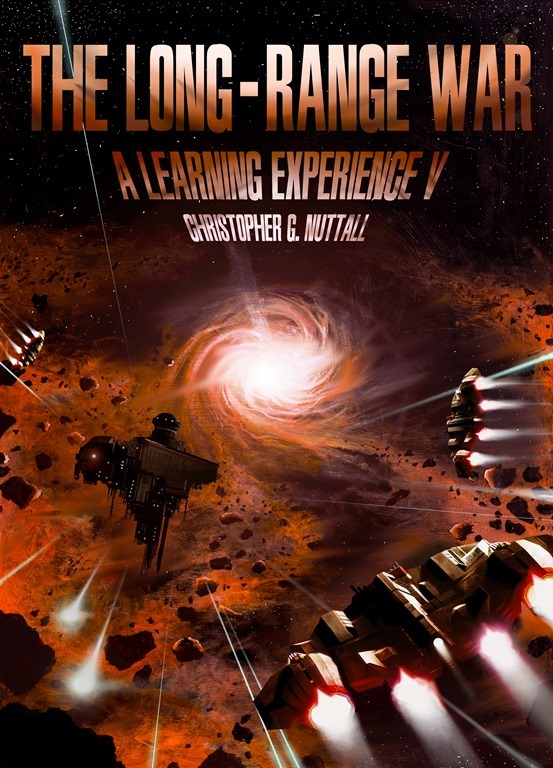 Hundreds of thousands of starships, from five-mile-long superdreadnaughts and battleships to tiny destroyers and frigates, the latter crewed by client races, were floating near the gravity point, slowly readying themselves to jump the hundreds of light years to Hudson in a single second. As she watched, the first flotillas moved forward and into the gravity point, flickering out of existence and vanishing. Neola tensed, despite herself. She was all too aware, despite the optimistic reports from her scouts, that the advance elements might well meet a hostile reception. There had been human ships based at Hudson until recently. But it doesn’t matter, she told herself. The humans had superior firepower, but she had superior numbers. Vastly superior numbers. That’s why I sent the potentially disloyal elements into the fire first. She kept her face completely expressionless as the second and third divisions rumbled towards the gravity point. It had taken years, far longer than she would have liked, to start reactivating the reserve. The gentocrats who’d ruled the Tokomak for thousands of years couldn’t react quickly to anything, even a threat to their existence. They’d refused to believe that a race as young as humanity could threaten their enforcers, let alone themselves; they’d found it easier to blame Neola for incompetence than stretch their minds to encompass a younger race that posed a real threat. She supposed she should be grateful. They hadn’t had the imagination to comprehend that she might pose a threat too. They’d expected her to sit tight and wait, for years if necessary, until they decided how they were going to slap her wrist. She was only a handful of centuries old, after all. There was no need for any real punishment. And now they’re safely restrained, she thought, feeling a flicker of glee. They really hadn’t thought she could launch a coup. The idea was unthinkable until she’d actually done it. They can’t stand in the way any longer. Neola sobered as the third division of starships blinked and vanished. The gentocrats hadn’t bothered to keep the reserve up to date. It hadn’t mattered, not when the pace of innovation had slowed down to a trickle. A starship built a thousand years ago was no better than one that had been completed only last week. But things were different now. The humans had proved themselves to be revoltingly ingenious and some of the other younger races were starting to follow in their footsteps. It was vitally important, if Tokomak supremacy was to be maintained, that the humans be enslaved or exterminated as quickly as possible. They were giving the other races ideas. Her eyes found a cluster of icons moving into attack position and narrowed, sharply. The squadron commanders were young, only a few hundred years old. They’d had nothing to look forward to, but a long slow climb up the ladder … until now. She’d shown them that someone could overthrow the established order and take power for themselves, she’d shown them – inadvertently – how she herself could be overthrown. She wondered, grimly, which one would have the imagination to make a bid for power. The gentocrats would take years to plan a coup, more than long enough for her to nip it in the bud, but someone from her own generation might move faster. No, would move faster. Neola knew she wasn’t the only one to been impatient, over the last few centuries. The people she’d promoted – for having a certain level of imagination, for being able to think outside the rules and regulations they’d enforced on the known galaxy – were the ones most likely to be dangerous to her. Their ambitions would not be satisfied with anything less than absolute power. It was, she acknowledged privately, a deadly balancing act. She needed people who could think outside the box … and there were very few of them, even amongst the young. Fleet operations had been so bound by formality over the last thousand years or so that too many officers simply didn’t know how to cope, when presented with an emergency. Their fleet exercises had been carefully scripted, with the winners and losers known in advance. But she couldn’t expect the humans to be conventional. Unconventional tactics were their only hope of surviving long enough to win the day. She watched another set of icons vanish and smiled to herself. The humans were good, but they weren’t gods. They’d be crushed by overwhelming firepower, even if her trap failed completely. If she had to fly her fleet all the way to Earth and turn the planet into a radioactive wasteland, she could do it. She would do it. If worse came to worst, she told herself time and time again, the Tokomak could trade hundreds of starships for a single human ship. She would still come out ahead. A blue icon appeared, near the gravity point. Neola allowed her smile to widen. Local space on the other side was clear, then. Very few races would challenge a Tokomak ship, even one that was completely alone, but it was well to be sure. Her intelligence staff had reported all sorts of rumours making their way through the empire, from vast defeats that had never happened to talk of mutiny and revolution. She was all too aware that the staff might not be picking up everything, no matter what they claimed. The underground knew how to hide itself. It would have been exterminated by now otherwise. Jenny sucked in her breath as more and more icons appeared on the display. The gravity point was disgorging a veritable river of starships. SUS Schlieffen, her cruiser, was more advanced than any of the superdreadnaughts and battleships forming into rows and advancing towards the planet, but Jenny doubted they’d survive long against such firepower. She prayed, silently, that the cloaking device held. The Tokomak weren’t trying to hide. Their sensors were sweeping space so thoroughly that they’d probably know the exact location of every speck of dust by the time they headed to the next gravity point. She might have to order her ship to back off before the Tokomak had a chance to spot her. They’d risked everything to grab SUS Odyssey. She was fairly sure they’d be just as interested in grabbing Schlieffen. The shortest route to Earth, Jenny thought. It would still take months for the enemy fleet to reach the planet, and she had her doubts about their logistics, but there was no doubting the Tokomak’s willingness to expend starships to crush their enemies. Half the ships on the display would be crewed by client races, utterly expendable as far as their masters were concerned. They’re on their way. She studied the display for a long moment, noting just how many ships had started to blur together into a haze of sensor distortion. Tokomak ECM was inferior to its human counterpart – the Tokomak hadn’t faced any pressure to improve or die for thousands of years – but quantity had a quality all of its own. Her passive sensors were having fits trying to keep track of each and every enemy starship. She had the nasty feeling that there were more enemy ships in the system than her sensors could detect. They might well be using their own ECM – and cloaking devices – to hide part of their fleet. Although they’d be taking a risk, she thought. With so many ships in such a confined region of space, the odds of a collision are non-zero. She dismissed the thought with a flicker of irritation. The Tokomak probably wouldn’t care if two of their ships collided, even if they were battleships. They had thousands of active starships and tens of thousands of starships in the reserves. Schlieffen could expend all her missiles, with each hit a guaranteed kill, and still lose. Quantity definitely had a quality all of its own. She sucked in her breath as she looked back at the display. The torrent of starships hadn’t stopped. Hundreds of superdreadnaughts were gliding through the gravity point, their weapons charged and their sensors searching for trouble. Whoever was in charge over there was no slouch. Normally, the Tokomak were careful not to put too much strain on their sensor systems. But then, who would dare to attack them? Their defeat in the Battle of Earth, seven years ago, had been their first defeat for nearly a thousand years. And every ship they lost represented less than a percentage point of a percentage point of their overall numbers, she reminded herself. They could lose a thousand starships and never notice the loss. Hameeda walked down the long corridor, alone. It felt as if she was walking for miles, even though she knew the corridor was only a few short metres from one airlock to the other. She couldn’t help feeling nervous as she made her slow way towards the second airlock, despite all her preparations. It felt as if she was on the cusp of apotheosis or nemesis, the crowning height of her career or a disaster that would ensure she never served in space again. Her heart thumped so loudly in her chest that she was glad she was alone. Anyone escorting her wouldn’t need enhanced hearing to pick out her heartbeat. She stopped outside the second airlock and took a long breath. Her CO had told her, an hour ago, that it wasn’t too late to back out. She didn’t have to go through with the bonding. No one would fault her for changing her mind, even now. The vast resources that had been expended on preparing her for the process would be better wasted, then expended on someone who didn’t want to go through with it. Hameeda understood their concerns – and her mother’s fears, during their last call – but she had no intention of backing out. The old fogies, the ones so old they remembered living on Earth, simply didn’t have the imagination of the spaceborn. They feared technology even as it had given them a chance to reshape both their former homeworld and the galaxy itself. Hameeda and her generation embraced the promise of technology, without fear. The future was within their grasp. And we must make sure we have a future, she thought. Because there are always those ready to take it from us. It wasn’t a pleasant thought. Her mother had been a refugee from Afghanistan, from a life so alien that Hameeda had problems grasping that it had ever existed. The mere concept of being forced into eternal servitude, simply for being born female, was difficult to grasp. How could someone be so uncivilised? And yet, after her mother had told her yet another horror story, Hameeda had looked it up. If anything, her mother had understated the case. Earth was an uncivilised world. They fought over nothing, even when they could reach out and claim the stars themselves. Their mere existence was a reminder that the human race could sink back into the mud. Her reflection looked back at her. Hameeda had kept her mother’s dark hair, darker eyes and tinted skin, even as she’d spliced more and more enhancements into her genome. She was stronger, faster and fitter than any groundpounder, more than capable of holding her own in a fight. But she felt hesitant now. If something went wrong, if one of the doubters had been right all along … she’d be dead before she knew it. But life was risk. Safety was an illusion. And she knew better than to feel otherwise. Hameeda took another breath, then pressed her hand against the sensor. There was a long moment as the security systems checked and rechecked her identity, then the airlock hissed open, revealing a vast hanger. Hameeda suddenly felt very small indeed. The LinkShip floated in the centre of the chamber, dwarfing her. It was tiny, compared to a regular starship; it was barely sixty metres from bow to stern. And yet, it was also the most advanced starship in the galaxy. Her FTL and realspace drives were the fastest known to exist, faster even than a courier belt. It had taken years to turn the concept into reality. Hameeda had spent almost as long training to serve as its – her – commanding officer. She drank in the sight for a long moment, her eyes wandering over the dark hull. The LinkShip looked like a giant almond, its weapons and defences carefully worked into the material so they didn’t spoil the ship’s lines. Hameeda wasn’t sure how she felt about that, even though she admired the elegance. An observer would not have to look inside the ship to know she was a distinctly non-standard vessel. And yet, it was a step towards a human aesthetic that was obviously different from the galactic standard. Too many races, even the ones that had been walking the stars when humanity had been crawling in the mud, used modified Tokomak designs. Humanity had to be different. Bracing herself, she activated her command implants and sent a command into the computer network. The world seemed to shimmer around her. Hameeda closed her eyes for a long moment as the teleport field made her entire body tingle, then opened them again. She was standing in the LinkShip’s command centre, alone. Her lips curved into a smile. The old fogies distrusted teleporters, asking all sorts of questions about souls and other unquantifiable issues none of the spaceborn understood. To them, teleporting was normal. Hameeda had been having her molecules broken down into energy and put back together again since she was a child. It was normally very safe. Unless there’s a jamming field, she reminded herself, as she rested her hands on her hips. Or a delay that causes the energy pattern to start to degrade. She pushed the thought out of her head as she surveyed the command centre. It looked bland and boring, compared to a starship’s bridge, but it was hers. A single chair, sited in the exact centre of the chamber; a helmet, primed to make the first connection between Hameeda and the ship’s datanet. There were no consoles, no display … there were emergency control systems, in another compartment, but very little effort had been wasted on them. Anything that broke through the LinkShip’s defences would almost certainly be enough to destroy the ship, or – at the very least – be completely beyond repair. Hameeda had been told, time and time again, that there would be very little hope of long-term survival. Once the Tokomak realised what the LinkShips were, they would do everything in their power to destroy them. Their mere existence was an affront to the laws the Tokomak had written for the entire galaxy. And they may have had good reason to ban direct organic-computer interaction, Hameeda thought, as she sat down on the chair. We simply don’t know their reasoning. She shook her head. The Tokomak had banned a lot of things, without bothering to explain their reasoning. Some of them made sense, she supposed; others appeared to have been banned without a valid reason. And still others appeared thoroughly pointless. She had no idea why they’d put a ban on interspecies relationships. It wasn’t as if they’d had to bother. A prisoner with a starship and freedom to fly, she thought. She’d be a naval officer for decades, of course, but afterwards … she’d be free. I wonder where I’ll go. She took a long breath, then pulled the helmet over her head. Her implants activated a second later, providing the datacores with a string of coded identifications that even she found hard to follow. She was dimly aware of classified systems steadily coming online, each one checking and rechecking the codes before slotting itself into the datanet. The sheer immensity of the LinkShip scared her, despite all her preparation. She’d put herself en rapport with an AI two weeks ago, but that had been different. She hadn’t been trying to bond with that AI. Hameeda blinked, surprised despite herself. It was talking … of course it was talking. Even a very basic system, a restricted intelligence, had simple conversational overlays, linked to a self-learning system that allowed it to evolve as it went along. She’d heard of RIs that had somehow managed to bootstrap themselves into true AIs, despite their programming. The old fogies had found that more than a little alarming, but Hameeda and her generation rather approved. Their creations had started to evolve. For a heartbeat, nothing happened. She had a moment to wonder if something had gone wrong, either with the technology or the command codes, before her mind was suddenly linked to something much greater. Her thoughts expanded with terrifying speed, reaching out to merge with the LinkShip’s datanet. She was suddenly very aware of everything from the drives, slowly readying themselves to push the LinkShip out of the hangar and into open space, to the weapons systems, currently powered down but ready for immediate activation if she had to go to war. She was linked to the ship … no, she was the ship. It was practically her body. Wow, she thought, as a torrent of data poured into her brain. The ship’s sensors were sucking in data from all over the station. She could see everything. They were so sharp that she could even see a handful of starships holding position outside the station, watching and waiting. She felt a stab of bitter annoyance as she remembered why those starships were there. The naysayers had insisted, pointing out that the LinkShip might go insane. And they were wrong. She powered up the drives slowly, watching as power ran through the tiny starship. It really was a miracle of science. She’d known that all along, of course, but she hadn’t really understood it until she’d actually touched the datanet. They’d miniaturised all sorts of systems in order to cram them into her hull, despite the risk. Warning icons flashed up in her mind as she checked the self-repair functions, pointing out their limitations. The naysayers had had a point about them, she reflected ruefully. A single hit might well be enough to cripple the LinkShip beyond repair. Then we will have to be sure not to be hit, she thought, as she accessed the hangar datanet and opened the hatch. Luckily, we’re the fastest thing in space. The LinkShip practically lunged forward as she gunned the drive, throwing itself into the inky darkness of space. Hameeda felt her mind split in two, one half thinking it was still human while the other half thought it was a starship. Space was both incredibly dangerous, lethal even to an enhanced human, and her natural habitat. Her mind expanded, once again: the station, the starships, a handful of test beacons … she was suddenly very aware of their exact locations. Subroutines within her mind assessed their positions, calculated their trajectories and analysed their threat potential. She would be safe enough, her mentality concluded, as long as she kept her distance. But they would also be safe from me, she thought, as she circled the station. She felt like a child purchasing her first in-orbit buggy. No, like a child who had moved from a buggy to a marine assault shuttle with nothing in-between. The sheer potency of the LinkShip frightened her as much as it thrilled her. I’d have to close the range if I wanted to fight them. Hameeda smiled to herself as she swung the LinkShip around, bringing the weapons online. LinkShip Alpha. She was going to have to think of a better name. Perhaps something defiant, something that fitted humanity … or perhaps something that would make children smile, when they read her name in their history books. A subroutine went to work, considering possible names, even as she refocused her mind on her targets. The first ser of beacons were not designed to be hard to hit. Baby steps, she told herself, as she started her attack run. Her phasers jabbed out, time and time again. The beacons vanished with terrifying speed. She reminded herself, sharply, that the beacons were practically begging to be killed. The next set of targets would be a great deal harder. You have to learn to walk before you can run. But she wanted to run. Her mind had blurred so much into the ship that she was no longer truly certain where she ended and the ship began. Indeed, her mentality had imprinted itself upon the datanet. Her lips twitched in annoyance. The Solar Union might have been reluctant to build a ship that was commanded by an AI, but it had no qualms – or at least fewer qualms – about designing a ship to draw from a human mind. There was a part of her that simply wanted to throw caution to the winds and run as fast as she could, crossing the entire solar system in a split second. But her duty held her firmly in place. Hameeda put the thought aside for later consideration as she put the LinkShip through its paces, systematically taking out target after target. The tests grew more complicated as she progressed, from targets that were hidden behind stealth coatings and cloaking devices to targets that actually shot back. She discovered that the LinkShip was perfectly capable of engaging targets while dodging incoming fire, although it lacked slammers and other heavy missiles. But with a little twiddling, she could turn the drive into a makeshift slammer. Who knew what would happen then? I might get caught in the blast, she told herself. It was the sort of trick that worked in bad movies, but was completely useless in the real world. I’d have to be well away before the explosion hit. It took her a moment to draw her mind back to the here and now. Admiral Keith Glass wanted to board. She accessed the teleport system, synchronised with the station and yanked him onto the LinkShip, deliberately materialising him in the command centre. The process was easy, with the ship’s datanet handling the transfer, but a chill ran down her spine as she realised just how many buffers Glass’s pattern has passed through. Perhaps the old fogies were right to be concerned about teleporting. He appeared in front of her, his face darkening as he looked at her. It was harder than Hameeda had expected to disengage herself from the helmet and stand. Her legs felt wobbly. Her uniform was damp with sweat. The datalink is still engaged, she thought. She might have disengaged from the helmet, but she was still linked to the ship. I can never leave again. She had to smile at the thought. The Solar Union could have produced ten cruisers for the cost of a single LinkShip, although she suspected that costs would be going down now the design was finalized. It wasn’t a small amount. The Solar Union was immensely rich, compared to many of the other younger races, but the cost was notable. If the first LinkShip didn’t pay off, in everything from tactical advantages to new technology, it was unlikely a second would be built. Her ship had to be a success if she didn’t want to remain unique. The third of Heinlein’s juveniles, Red Planet starts the development of themes that Heinlein would explore for the remainder of his career. Freedom, personal responsibility and the importance of being prepared to fight, at a moment’s notice, for both. It reads a little more cumbersome than Space Cadet – in some ways, Red Planet is a regression – but it very definitely has its moments. I enjoyed reading it when I was a child. When they reach the school, they clash with the new headmaster, Mr. Howe. Howe confiscates Willis, something that comes back to bite him when Willie remembers and repeats a conversation between Howe and Beecher, the colonial administrator. Beecher has unpleasant plans for the colony, starting with blocking the annual migration from the north to the south so that both sets of buildings can be populated at the same time. This would be lethal to the colonists, old and new, as the reason behind the migration is to avoid severe winter weather. Jim and Frank set out to warn their parents and the rest of the colony, skating along the frozen canals. They nearly die, but because of their friendship with another Martian they are helped to reach their home by the natives. The colonists, running out of time, start the migration anyway, which nearly leads to disaster when they are confronted by Beecher and the corporation’s troops. There is a brief skirmish, which ends with Beecher’s defeat and the colonists proclaiming their independence from Earth. Unfortunately, the native Martians have also decided to take a hand. After killing Howe (for his abuse of Willis, now revealed to be a Martian child) they order the remainder of the colonists to leave Mars. Fortunately, because of Jim’s friendship with Willis, the Martians reluctantly relent. Jim is forced to give up his friend so he can make the transition into adulthood. On a micro scale, Red Planet has many nice moments. The core of the story is the friendship between Jim, Frank and Willis, with all three of them risking their lives for the others. Jim, the viewpoint character, is very understandable, even though his society is quite different from ours. Heinlein also gives him a mentor, of sorts, in the old and erratic Dr. MacRae, who is stubborn, defiant and, when the colonists falter, gives them a pep talk that keeps them going. A juvenile character is always restricted by his age – a common problem in such novels – but Heinlein neatly sidesteps the issue here. He makes it sound logical that Jim would be in a position to realise what is actually going on and do something about it. Later, he also captures the unwillingness of some people to rock the boat, even when disaster is breathing down their necks. But, on a macro scale, Red Planet has many lessons for teenage boys. The core conflict, between the colonists and the corporation, is precisely what you tend to get when the people in charge are divorced from the realities on the ground. Beecher and his superiors simply don’t understand why the migration is important, nor does Howe grasp the dangers of venturing outside the domes (and thus trying to confiscate guns). Heinlein neatly demonstrates how people get trapped by a steady stream of new rules, an early display of the ‘cook a frog by slowly turning up the heat’ principle. Each of the new rules, building on the one before, strips more freedom and independence from the boys until it is too late. There is a lesson here for those who wonder why the bureaucratic state is feared. Part of the problem, of course, is that each of the new rules allows newer and better opportunities for cheating and corruption. The people with the right mindset find ways to exploit it, while others are forced to suffer. However, it is impossible to convince the rule-makers – and the grafters – that perhaps the rules should be cut down sharply. The people who benefit from such stupidity have no interest in making life harder for themselves. Indeed, the corporation is not evil (although Beecher very definitely is). It’s just ignorant and stupid. And it is that ignorance that threatens to get everyone killed. A further problem is the sheer time it can take to convince policy-makers to change their minds, if they can be convinced. By the time the colonists can manage to get a protest back to Earth, it will already be too late to stave off disaster. They have to take matters into their own hands or die in the winter. Indeed, Heinlein seems to have worked out how a habitable Mars might look like – it’s clear that elements from Red Planet were later worked into Stranger in a Strange Land – and how it might shape its population. Mars of Red Planet is both strikingly familiar and alien enough to be different. It’s the sort of place an adventurous young man might want to grow up. And yet, the book also shows signs of its era. There is surprisingly little female presence, save for an annoying little sister … but then, the book also makes a case for the female right to keep and bear arms. (Useful, in a dangerous environment.) The bad guys also pick up the idiot ball from time to time: Howe confiscates Willis because he hears the Martian repeat a series of unflattering remarks about him, but he doesn’t realise that Willis will also hear and repeat his discussion with Beecher, which sets off the chain of events that lead to their defeat. Overall, Red Planet is a good read – and very appealing to teenage boys, its intended audience. And its core message has not aged at all.